It's one of the safest parts of America, and it's getting safer. The Customs and Border Protection study, obtained with a Freedom of Information Act request, shows 3 percent of Border Patrol agents and officers were assaulted last year, mostly when assailants threw rocks at them. That compares with 11 percent of police officers and sheriff's deputies assaulted during the same period, usually with guns or knives. In addition, violent attacks against agents declined in 2009 along most of the border for the first time in seven years. So far this year assaults are slightly up, but data is incomplete. 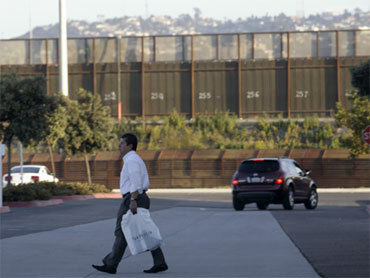 "The border is safer now than it's ever been," said U.S. Customs and Border Protection spokesman Lloyd Easterling. He said one factor is that with fewer jobs available amid the U.S. recession, illegal immigration has dropped. And responding to security concerns after 9-11, the Border Patrol has doubled the number of agents in the region since 2004. Nonetheless, border lawmakers and governors say their region is under siege and needs more troops. "Violence in the vicinity of the U.S.-Mexico border continues to increase at an alarming rate. We believe that this violence represents a serious threat to the national security of the United States as well as a serious threat to U.S. citizens that live along the 1,969-mile long border," a dozen bipartisan members of Congress from border states wrote President Obama. In Arizona, a stringent new immigration law takes effect next month, requiring police to question suspects' immigration status if officers believe they're in the country illegally. Arizona Gov. Jan Brewer said in a televised interview last weekend: "We are out here on the battlefield getting the impact of all this illegal immigration, and all the crime that comes with it." In response to the concerns from the border states, Obama pledged to send 1,200 National Guard troops to help and spend an extra $500 million on border security. His one-time rival for the presidency, Arizona Sen. John McCain, said he should send at least 6,000 troops, which are needed because he said Arizona leads the nation in marijuana seizures, suffered 368 kidnappings in 2008 and has the highest property crime rates in the U.S. But FBI crime reports for 2009 says violent crime in Arizona declined. And violent crimes in southwest border counties are among the lowest in the nation per capita - they've dropped by more than 30 percent in the last two decades. Of America's 25 largest cities, San Diego - with one out of four residents an immigrant - has the lowest number of violent crimes per capita. Opponents of increased border security are frustrated by descriptions of a wave of violence when the statistics show the region to be relatively safe. "Politicians are hyping up this incredible fear across the country about the border, but these numbers show these are lies being perpetrated on the American public," said immigrant advocate Isabel Garcia at Tucson-based Derechos Humanos. "The warnings about violence are just an excuse to crack down on migrants who want to work and be with their families." Even residents of the border region who want more security are surprised by the talk of violence. "I have to say, a lot of this is way overblown," said Gary Brasher of Tuboc, Arizona, who is president of the Coalition for a Safe and Secure Border. So why send troops to the region? "That's really something to ask the White House," Easterling said. White House spokesman Mike Hammer said "there are other rationales for why those border deployments are occurring" but declined to name any of them. "I would really put this to the Department of Homeland Security," he said. Homeland Security spokesman Matthew Chandler said he couldn't answer the question. He later sent a written statement that said more help is needed "to expand long-term the successes that have been realized to date." Governors along the border say improved crime rates don't counter their concerns about risk. "The federal government currently does not know who is entering our country and when, which obviously creates tremendous security concerns," said Brewer's spokesman Paul Senseman. And in Texas, "we respond to threats based on risk, not occurrence," said Gov. Rick Perry's spokeswoman Katherine Cesinger. Thus Perry has activated a secret state border protection emergency plan. "With the safety of Texans on the line, we can't afford to wait," he said. New Mexico Gov. Bill Richardson, who ordered the National Guard to patrol the border in his state six weeks ago, is concerned about "the potential for drug cartel violence spilling over the border," spokesman Gilbert Gallegos said. California Gov. Arnold Schwarzenegger spokesman Francisco Castillo said that while "we've seen some success," troops are needed "to provide more security along our borders." Concerns about danger come, in part, from Mexico, where raging cartel violence has taken 23,000 lives in three years, often within view of the U.S. border. There's frequent talk of the potential for that violence to spread across the border, although so far it hasn't happened to any significant degree. Several high-profile and frightening incidents have added to the fears: Authorities suspect an illegal immigrant working for drug smugglers killed Arizona rancher Robert Krentz in March, and last year Border Patrol agent Robert Rosas, 30, was murdered while on patrol near San Diego. "Agents now have to question if they will be ambushed," U.S. District Judge M. James Lorenz said as he sentenced a 17-year-old Mexican to 40 years for killing Rosas. In fact, agents in the San Diego region are less likely to be attacked these days. "Agent Rosas' death changed the way we do business. Agents are on high alert, we have to be ready. But if you just look at the numbers, assaults here are down 27 percent," said Border Patrol spokesman Jerry Conley, who worked with Rosas. He said that since Rosas' death, officers don't venture into potentially dangerous situations without backup. Solo patrols are rare, and they emphasize safety precautions. There are exceptions to the trend: Assaults on agents in the Laredo, Texas, region increased from 44 in 2008 to 118 in 2009, and they increased in the neighboring Rio Grande Valley as well. But the bigger picture is one of increased safety. In fiscal year 2009, there were 1,073 violent attacks - mostly thrown rocks, bottles and sticks but also 48 incidents in which a gun was fired - against the 20,119 Border Patrol agents, down from 1,097 violent incidents against 17,819 agents in 2008. In addition to those agents, another 22,000 officers work at the nation's border crossings and airports, checking people as they enter and exit the country. It's one of the safest jobs in law enforcement: Last year 17 of them were assaulted, a 74 percent decrease from 2008. Edward Alden, a senior fellow at the Council on Foreign Relations, said it's time for lawmakers to reconsider what they'd like to see happening in the region. "Border security has become the most overused, and least understood, concept in the struggle over what to do about our broken immigration system," he said. "While an election year may not be the best time, the United States finally needs an honest debate over what it means to secure the country's borders."